In April and September, each year, we have a group of about thirty Japanese students from Teikyo University in Tokyo here on this campus. They come to Durham to improve their communication skills in English by taking English classes and also to strengthen mutual understanding and friendship with Durham University students and local people by interacting with them. By joining our study-abroad programme, they are seriously able to embody the university’s educational policies. Scholarship Programme> Teikyo University provides scholarship programmes for international students. Please click here for more information. Our free Japanese class will start on Wednesday, 1 May 2019. The class will continue till July. Please see this page for more details! For more information, please contact Helen on helen.mcaree@durham.ac.uk . Jack uploaded his blog post on March Medical and Economics Courses. Please have a look! View our photo gallery » We added some photos of our students' activities in the UK. 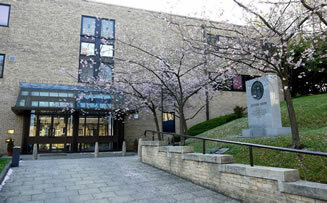 We have three buildings on the campus of Durham University. One is a University Lecture Building where Teikyo University students from Japan study mainly English, and the other two are Halls of Residence where our students and Durham University students live. 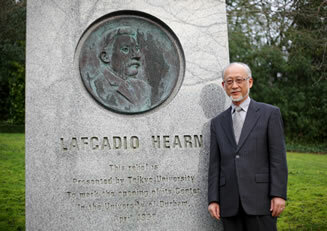 Our main building, called “Lafcadio Hearn Cultural Centre,” is named after a Greek-born Irish writer Lafcadio Hearn (1850 – 1904), who spent his teens (13 – 17 years old) studying at Ushaw College in Durham. He then went to America and became a journalist working for several newspaper companies. In 1890, he went to Japan and became an English teacher in Matsue and in Kumamoto and later became a Professor of English Literature at the-then Tokyo Imperial University (today’s Tokyo University). He was a prolific writer of books about Japanese folk tales and English Literature. Since he acted as a powerful ‘literary bridge’ between Japan and the Western world, our University found it very appropriate to title the building in his name. I do hope that having Teikyo University here in Durham is meaningful both for Japanese students and for Durham University and its students, as well as local people.